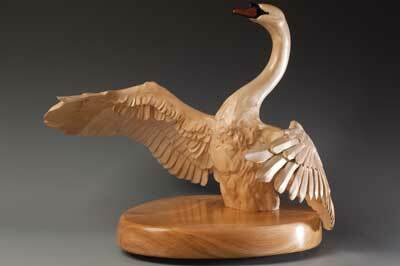 Artistic since a young age, Martin Preston has been carving for around 15 years. 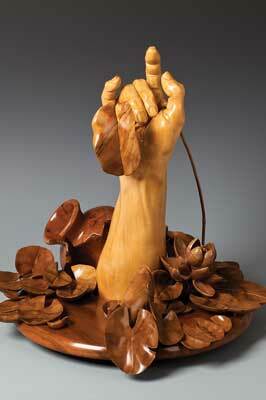 His love of art remained a hobby while he pursued his keen interest in the sciences professionally, and he now creates sculpture in both wood and bronze. 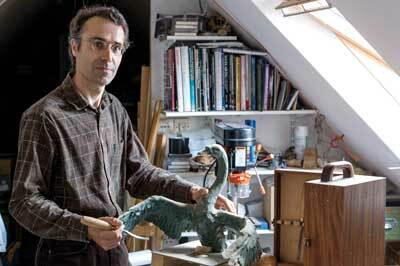 His first commissioned piece in bronze was for a bust of the novelist and screenwriter Julian Fellowes. He lives in Dorset with his wife and two children. How did you start carving? I started carving in the early 1990s. Back then, I used to paint botanical watercolours and my wife's mother suggested that I might like to try carving. I bought a piece of lime from my local wood merchant, chose a hand as a subject so that I would never be without a model and began with a couple of mortising chisels. I've always drawn or made things. Recording and translating the things I see is just an integral part of who I am. Carving appeals to me for the naturally warm and tactile properties that wood brings to a sculpture - properties that bronze doesn't have. Carved pieces seem to draw people in. Something in the nature of wood makes them want to get in close and interact in a way that they don't with metal. Anything I know about carving has been learned through trial and error. When it comes to practical skills, I've never been shy of trying something new. I like to think that you don't really know what you can't do until you've failed, so why not have a go? Things that I see around me. I'll see the attitude in a flower or catch a fleeting pose in our collie and something inside says "that would make a nice sculpture." Some of these moments persist and some fade, but all of them get stored up somewhere in the subconscious to later inform something I am creating. What are you currently carving? I am working towards a series of two or three figures where I will carve the figure in wood and combine it with a lot of detail cast in bronze. I am hoping the contrast between the clean lines of the figure and the complex detail in the bronze will make for a pleasing effect. I have a lovely 2mm, yew-handled J. Addis & Sons straight chisel. It's not the most useful by any means, but I'm very fond of it. It has an elegance and balance that appeals to me and I can still pick it out on the bench when I am carving without my glasses on! What is your favourite style of What is your favourite style of carving to do, and why? I like to carve naturalistically and in the round. I also like to finish a piece so that the grain is really brought into its own. I always think that it's a sin to carve wood and ignore the reason wood is so beautiful. The pre-Raphaelites are a great favourite of mine, especially Waterhouse. I am also in awe of some of the great Italian marble carvers. I remember seeing a statue by Michelangelo - there was just something about a hand lying against a leg that made me stop and think, "I'd like to do that." My workshop is in my attic and so commands lovely views over the beautiful Dorset countryside. I have a window looking south through oak (Quercus robur) trees and across fields to the Wessex Ridgeway and another looking north towards Sherborne across a farm with a typical patchwork of small high-hedged fields and oak woods. As I write, this year's lambs are frantically racing around the field in the late spring sunshine. I am delighted to carve for anyone for whom it brings pleasure. Keats said that "a thing of beauty is a joy forever." To create something that someone else finds beautiful is pretty special, irrespective of who they are.